Imlay offers four sizes of rope bags for different lengths and diameters of ropes. The ROPE SILO, in small or large, is our most sophisticated model -- sized to fit 200 to 300 foot ropes. Somewhat less fancy, the BAGARINO offers good performance for ropes up to 120 feet (9mm) or 150 feet (8mm). The BAGETTE is made for a 200' 6mm Pull Cord, but works OK for 60 foot ropes when needed. All our rope bags feature flotation, flow-through mesh for instant drainage, and a flared-to-the-top shape and stiffened rim to make stuffing the rope easier. Ropebags work best when they are about 80% full. Filling up that last 20% can be a chore and, after all, that is the part of the rope we use the most. Bagette 7.4 oz (225 g) 200 ft 60 feet? 60 feet? Isn't There a Medium Size? There is not. There used to be, but I renamed it "Large" which I hope is less confusing. Many years ago, there was a Large for a 300' 9mm rope, but nobody bought it, so it was dropped. However, the topic of the many ways to use the ropebag for deployment will have to wait. This How-To is about stuffing the rope in the ropebag, ready to be deployed. Tying In - the first step is to tie the bottom end of the rope into the rope bag. Several options are available. I prefer poking the end through the bottom grommet, and tying the end to the bottom-cross strap using a triple-clove hitch. 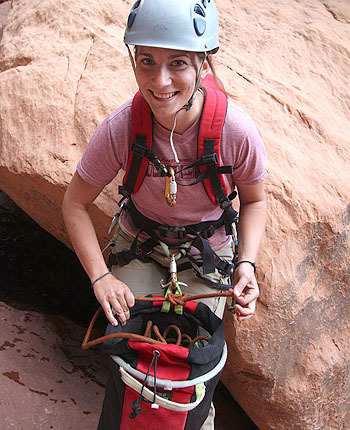 Having the bottom end of the rope available can be helpful if you need another short section of rope for something. If tying ropes together for a pull, tying ropes together with the ropebag in place makes deployment somewhat easier. Set Up for Stuffing - the second step is to set up the ropebag for easy stuffing. Fold back the drawcord rim, and a loop inside can be found. Clip the loop to your harness center, so the bag hangs conveniently in front of you. 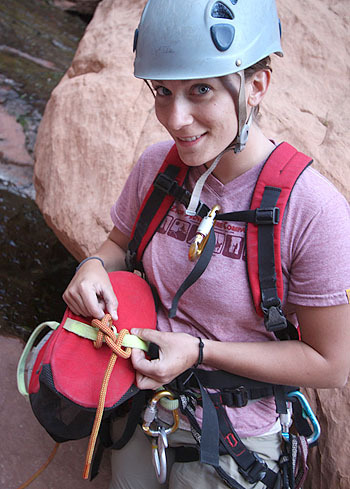 Run the rope through a high clip-point, such as a carabiner on your sternum strap or high on your shoulder strap. Some people use their helmet chin strap, but I have always found this unpleasant. A sling doubled around the neck also works. 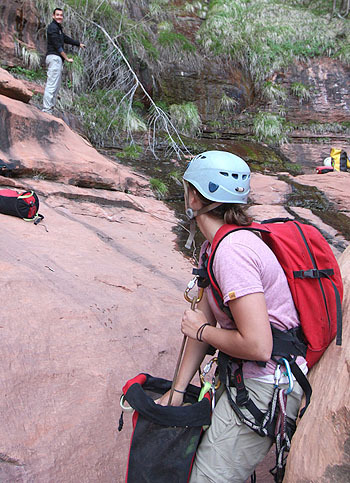 Sometimes, the rope held high in a carabiner by a willing partner is the best teamwork solution. Stuff the Rope - vigorously stuff the rope randomly into the bag, alternating hands. Every 20 strokes or so, push the rope in the bag down firmly to compact it as much as possible. Once the bag has some rope in it, you can grasp it with your knees to steady it. Helping Stuff the Rope - friends can help out by clearing the rope from obstacles, or by holding the bag steady. Generally, feeding rope to you is not so helpful, as a little bit of back-tension (or drag) helps make the process faster. Tie Off the Top End - when finished, tie the top end of the rope off to either the inside loop or one of the handles. A square knot works well for this. Cinch up the top, and hand the rope off to someone else to carry! Can I Throw My Ropebag? Certainly! At times, throwing the ropebag is the best way to deploy the rope. But please, be sure to remove carabiners from the rope bag before tossing. While a treatise on effectively using the ropebag is perhaps a bit long for this context, there are plenty of times when throwing the bag works really well. Times when it does NOT include: into FLOWING water (this can get really ugly, fast); into bushes and cacti; into crowds of people below; and when any of the previous situations could be true. 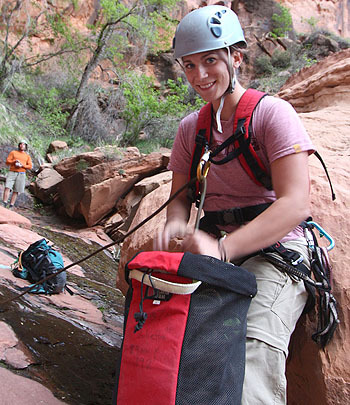 You can also rappel WITH the bag, though this can be quite awkward as the rope tends to come out of the bag with twists which try to jump out of your hand. 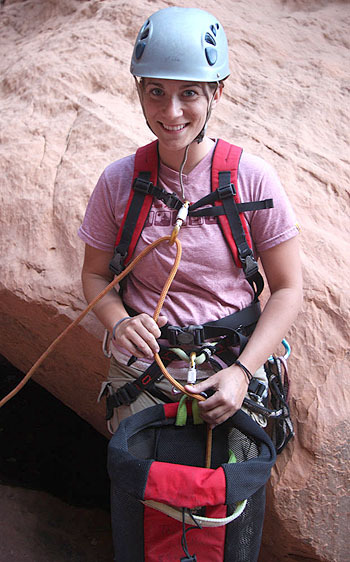 I have found it best to clip the ropebag to my harness gear loops, and pull out ten feet of slack, then rappel about 10 feet, repeat... Once I get a clear view of the landing zone, and none of the above conditions apply, I drop the rope bag. Imlay Rope bags are made in The Philippines, with materials sourced primarily in South Korea.